Jamuna Gurung scored four goals alone as Nepal hammered Pakistan 8-0 to start 2nd SAFF women championship in an impressive way at CR&FC Grounds, Colombo, Sri Lanka. Gurung scored four goals in the first half before being substituted in the first half while Pramila Rai, Sajana Rana, Anu Lama and Dipa Adhikari scored apiece for Nepal. Nepal, having almost the same squad that thrashed Pakistan 12-0 in 1st SAFF Championship held in Bangladesh, started the game in a brighter note as Nepal opened the firing early in 9th minutes. Dipa Adhikari played an influential role as she supplied a sublime cross that created so much space to sniper Jamuna Gurung who slotted home from a close range that needed a slight deflection off Pakistani defender. 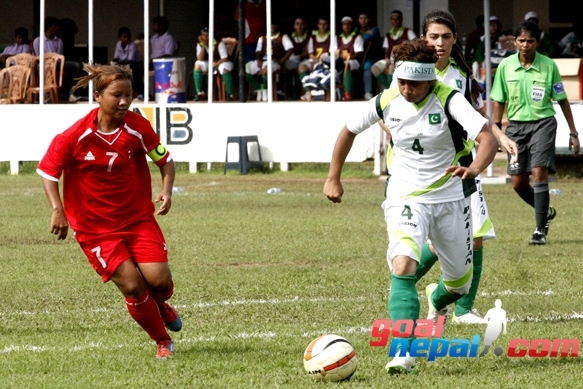 Nepal doubled the tally in 16th minutes through Pramila Rai, who performed outstanding game throughout the game. Rai made a brilliant run in the left flank, penetrated inside the Pakistani defense line with the ball and shot on target. Pakistani goalie, Mahapara Sahid made a blunder letting the ball go under his arms. Pakistani players protested against the decision for a while but referee from India Mariya resumed the match. Nepal had to wait another 16 minutes to extend the tally. Jamuna Gurung scored her second goal with the support from fellow striker, Anu Lama. Lama was quick enough to send the good cross to Jamuna who was totally unmarked inside the box and she slammed domw with her powerful shot. Gurung completed her hat trick two minutes later after Pakistani goalie, Mahapara failed to get hold on the bll properly. Sajana Rana, who was solid in the defensive midfield, extended the tally in 42nd minutes. When the match was heading towards the first half, Gurung scored her fourth one utilizing a good cross off Dipa Adhikari. Nepalese girls enjoyed the lemon break making nose 6-0 up. 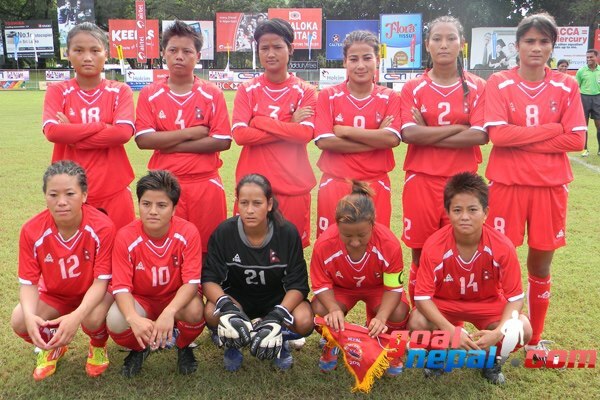 Nepal’s head coach, Kishor KC made a tactical change, replacing three important players; Jamuna Gurung, Niru Thapa and Pramila Rai in the second half and fielded Laxmi Poudel, Anchali Waiba and Krishna Khatri. Nepalese team then played a good passing game in the second half rather than scoring more. Anu Lama scored seventh goal in 51st minute and impressive Dipa Adhikari completed the rout in 72nd minutes. Nepal will play next Maldives on September 10.